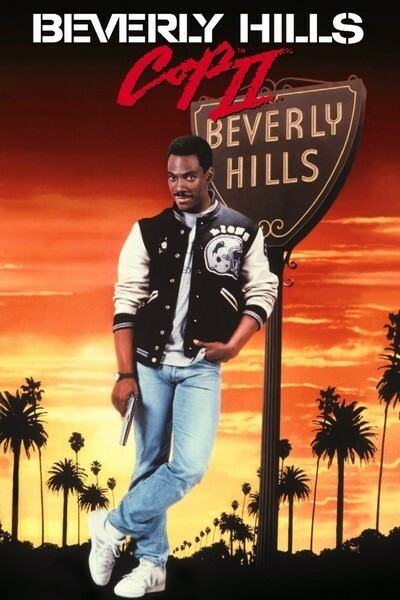 When his visiting buddy (James Russo) is murdered, a Detroit-based detective (Eddie Murphy) travels to Beverly Hills to investigate potentially criminal dealings at the art gallery where Russo worked, managed by their mutual friend (Lisa Eilbacher); but will Murphy’s efforts be foiled by local cops (John Ashton and Judge Reinhold) who resent his involvement? 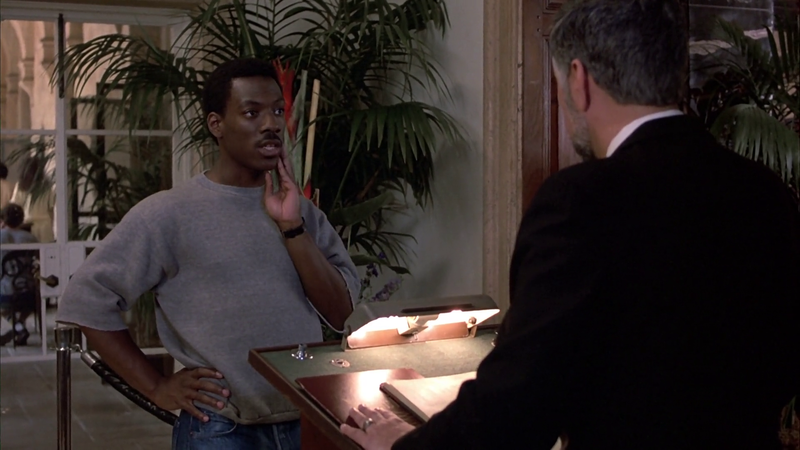 Peary writes that this “phenomenally successful Eddie Murphy comedy-crime drama” contains “some nice moments between Murphy and Beverly Hills cops Judge Reinhold and John Ashton, whom he wins over”, but argues that the “story is terribly written” and that director Martin Brest’s “comic touches are always disruptive”. However, he concedes that “Murphy saves the day, successfully fighting through his bad lines and improvising — hilariously — like crazy” as he “invade[s] ritzy establishments (fancy hotels, restaurants, art galleries, Beverly Hills mansions) or institutions and, using his con act, imitate[s] authority figures”. I think Peary’s a bit too harsh on this cult ’80s favorite: while it may be a “big joke” that Daniel Petrie’s script “received an Oscar nomination” (! 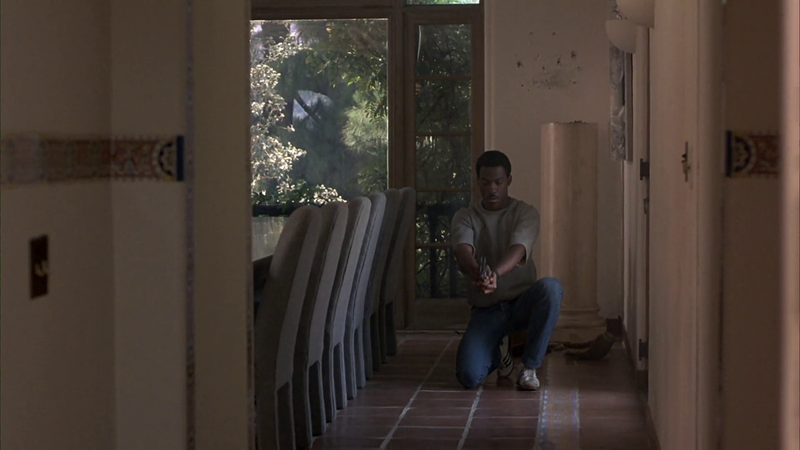 ), Beverly Hills Cop (the first in a lengthy franchise) remains a serviceable, well-executed, fast-paced thriller with plenty of danger and laughs. Murphy’s loyalty and persistence are charming, and the theme song is catchy enough to deserve its own “must-listen” status. I agree with you that Peary was overreacting a bit. It is, whether by intention or not, effectively a star vehicle for Eddie Murphy. It is his movie and it cemented him as a megastar in Hollywood. It’s all about capturing his improv, his creative profanity, and his deft comedic timing. I don’t think Petrie’s script is that bad. I don’t know that it was Oscar-worthy, but I can give a laundry list of Oscar nominations that I thought were even more egregious. Anyway, it probably would have gone nowhere, or at least peaked quickly, had it not been thoroughly entertaining and well-crafted in its flexible construction. It’s loose, engaging, it’s raucous, and audiences loved it, putting it in the top 3 during the year of Ghostbusters. In fact, it was such a hit, that a slew of cop buddy flicks and franchises started popping up all over the place afterward. Running Scared, Lethal Weapon… the late 80s well into the 90s popped out too many productions to count. But it holds up to repeated viewings nicely and it’s fun. This is a popcorn movie that’s only must-see for Murphy fans – who, no doubt, will find it highly entertaining. I’d seen it once before. For my part, I rather enjoy Murphy’s various (and often brilliant) stand-up films but ‘BHC’ doesn’t do much for me (which is to say, I’m not its audience). While I think it more or less works as a cop caper with some light comedy, I didn’t find it funny. ~with one exception: Murphy’s brief routine (seeking entry to an exclusive restaurant) using the gay persona of ‘Ramon’ is hilarious.